This has absolutely nothing to do with phylogenetics, but today (New Year's day 2013!) I've been starting the year with some R programming to pull data out of the raw output files from a program tpsDIG2 (by Jim Rohlf) that we use to get data from landmarks on digital skeletal x-rays of lizards. The first line gives the number of landmarks; subsequent lines give the horizontal & vertical pixel positions for each landmark; and the final lines give the image information & scale. 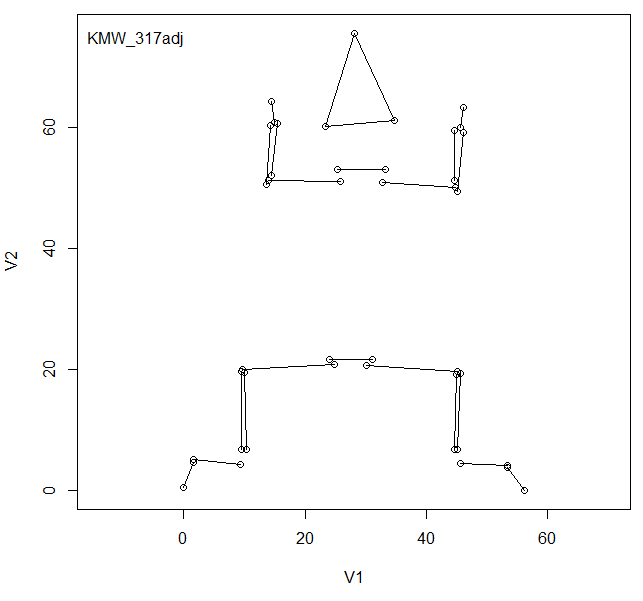 Obviously, in R we want to read in the file, translate it to meaningful (i.e., non-pixel) scale, and perhaps compute our desired linear measurements. We might also want to be able to visually inspect our data for errors. I have written two functions tps.process (to pull data out of the file and translate the scale); and tps.postProcess, which computes the linear measures we want from our input files. The first function is thus "general" (suitable for many people getting linear measures from .tps files); whereas the latter is specific to our data, although it could probably be modified and re-purposed easily. The code is posted here. Here's a quick example. 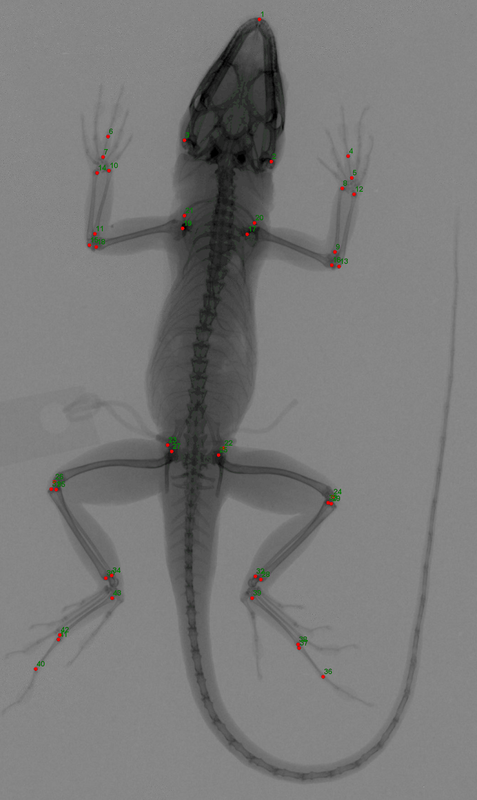 Note that I have also included a mode tps.process(...,type="anole") that visualizes the landmark data (for error checking) in a sensible way specifically for our x-rays. Now we have left & right measures for all the characters in our x-ray, above. Cool. Just to share its existence, package geomorph has the function readland.tps(file) to read tps files as well and package Momocs allows the placement of landmarks in case someone would like to try and place the landmarks in R.